Howard Friel´s book "The Lomborg Deception"
Who is right, Lomborg or Friel? Lomborg has seen the book manuscript shortly before printing and has written a 27 page rebuttal, to be downloaded here. Friel has responded with this 20 page reply. Here, Friel admits to have made two mistakes, one of which was pointed out by Lomborg. These mistakes are that Friel has mistaken "constant concentrations of CO2" for "constant emissions of CO2", and that he has in one place mistaken a century for a millenium. But the rest of Lomborg´s objections are rejected by Friel. "The Lomborg Deception" is, from start to end, one long criticism of Lomborg´s books. Two of the chapters deal with Lomborg´s "The Skeptical Environmentalist", and eleven chapters deal with Lomborg´s "Cool It!" (the American version of the book). If Lomborg were truly interested in finding what is "the real state of the World", he would be very concerned even if just a few of Friel´s points of criticism were justified. He would apologize for any misleading statements in his books, and insert proper corrections in his own list of errors. This is not what se see, however. Even though much of Friel´s criticism is to the point, Lomborg does not admit that he has made any mistakes at all. Instead, he uses a lot of spin to conceal his mistakes. And he writes: "I am proud of The Skeptical Environmentalist and Cool It, and I stand behind what I wrote in them." "...he quotes source material out of context . . . and consistently avoids engaging with the central arguments . . . This paragraph is loaded with inaccuracies and false premises"
It is remarkable that some of these accusations against Friel mimick the criticism that is repeatedly raised against Lomborg himself. For instance, Lomborg is often criticized for taking quotes out of context. As often before, he turns such accusations around and directs them at his critics. To the unprejudiced reader, all these accusations give the impression that Friel´s criticism is completely unjustified, and that Friel has misunderstood everything. This, however, is not how things are. In some cases, Friel´s criticism is indeed unjustified or built on misunderstandings, but in most cases, his criticism is justified. In what follows, I will try to treat Lomborg´s "rebuttal" one point at a time and clear up, as objectively as I am able to, what is right and wrong. Lindzen is a controversial climate scientist who has received much financial support from the oil industry. His theory on "the iris effect" is very doubtful. He certainly has not refuted the objections raised by Schneider and many others. See comment for p. 271 right here in Lomborg-errors. Friel unfortunately made a simple mistake which has no consequences for the general argumentation. Lomborg makes as much out of this simple lapse as he possibly can, using nearly one half page and inserting as many derogatory terms as he can. Friel postulates that Lomborg fails to document a single claim: ". . . nor does he provide convincing data later in the book as he promised in note 14." [Friel p. 50]. This is a drastic postulate, and it would need documentation. Friel fails to provide that documentation. Lomborg claims that in the chapter on biodiversity, he clearly documents and discusses the figure of 0.7 % species loss. He is not right. He discusses the figure, but it remains extremely dubious and weakly founded. This is certainly not "clear documentation". See Lomborg-errors here. Friel says that when analyzing current trends, Lomborg ignores such factors that might alter the trend in the future. This criticism from Friel is very relevant and to the point. A clear example is in the discussion of the number of people starving (see below). Friel is right that Lomborg should have considered if any factors might change the ongoing positive trend. Lomborg´s comments to this criticism (extrapolating current trends uncritically into the future) are completely irrelevant. To use his own term: "he avoids engaging with the central arguments". The theme here is the number of people starving. Lomborg has a figure (page 24 in TSE) showing that the number of people starving declines regularly and steadily from 1970 to 2030. However, things have turned out very differently, as seen in the latest FAO report, The state of food insecurity in the World 2009. The figure to the right is copied from that report and it shows that the downward trend described by Lomborg stopped already about 1996, five years before his book was published. The curve has been bent and now turns rather steeply upward. This is true not only for the total number of persons, but also for the percentage of persons that are undernourished - this has risen since about 2005. Lomborg was so cocksure when he wrote in 2001 that the numbers would continue to fall, but obviously he did not understand the underlying forces which could turn the trend. This is the main point of criticism stated by Friel, and he was right, even though he could have stated this point even more clearly. Instead of attacking Friel, Lomborg should express regret that his positive projections for the future did not come true. Besides this main point, there are som details to be dealt with. Lomborg postulates that all the numbers in the passage on starving people have the same source, a single table from a 1996 FAO report. This is directly untrue, as stated here in Lomborg-errors. Friel, too, has noticed that the data originate from two references, not one. And when he checks the latest of these, he correctly notices that the source is not so optimistic about the trend as Lomborg is. If Lomborg had listened to what was actually said in this report, he would not have been so cocksure. Lomborg has been criticized for the many times when he has quoted a text out of context so that the meaning is distorted or reversed. He now returns this criticism and accuses Friel of doing the same. That accusation is not quite fair. The example deals with the number of illiterate people. Lomborg´s original text on this point is a little ambigouous, and one may easily misunderstand the meaning of the figures, unless one reads the text very carefully. Friel has indeed misunderstood the text; but this is an understandable mistake, not an attempt at deliberate misleading such as in several of the cases when Lomborg has quoted texts out of context. Friel´s mistake is even more understandable because Lomborg´s use of the reference is flawed. It is no wonder that Friel has not been able to find Lomborg´s figures in the source, because Lomborg´s treatment of the data source is beyond good practice. See here (page 81) in Lomborg-errors. This again deals with the number of people starving, and the comments made above apply even more here. 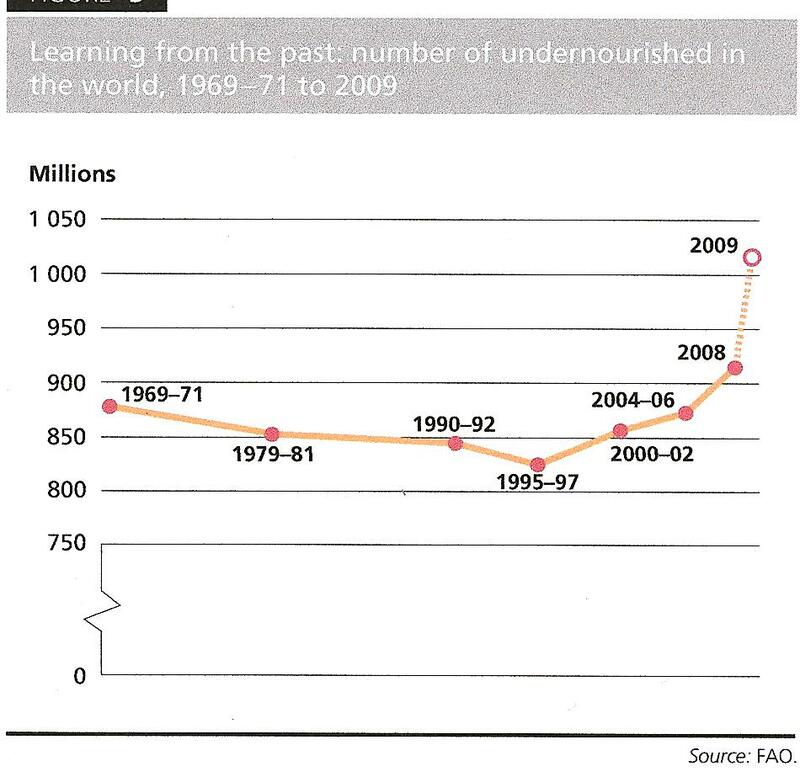 Friel says that malnutrition numbers increased in the second half of the 1990s, which demonstrates that Lomborg´s assessment of `remarkable progress´ was at best premature. As is readily seen from the figure inserted above (taken from the 2009 FAO report), Friel was even more right on this point than he was aware of. There is certainly no `remarkable progress´ - there is a remarkable backlash. Lomborg has indeed studied the 2009 report, according to his footnote on page 6, but even so he denies the obvious. He refuses to realize that he was wrong, and instead finds some minor details on which he believes he can criticize Friel. In doing this, the claims that the latest figure on the percentage of malnourished people is 16 %, and this is from 2004-6. But we know he is aware of the report from 2009, in which the percentage has recently risen to probably 19 %. Why does he conceal that? Of course, 19 % is still a little better than the 20 % figure from 1992, but Lomborg has a very weak point if he tries to convince us that this is `remarkable progress´. Concerning the situation in Africa, Lomborg accuses Friel of disregarding the percentage figures. But unjustly. Friel does deal with the percentage figures on his page 55 and again on page 57. What is more, the apparent decline in the percentage figures is partially due to Lomborg´s manipulation of the data, by splicing two incongruent data sets, as explained in Lomborg-errors here. The text here deals with David Pimentel and estimates of erosion rates. Concerning Pimentel, Friel uses this person´s prominence as an argument (pp. 62 and 63). Maybe he shouldn´t. Even prominent persons may err. And there are indications that Pimentel did indeed paint the picture in too dark colours (see here in Lomborg-errors, pp. 21-27). Concerning erosion rates, Lomborg´s text is indeed somewhat flawed (see here in Lomborg-errors, p. 105). And Friel refers on page 64 to the fact the Pimentel brings 11 documented sources as reference for his erosion estimates. It would require more scrutiny to decide if these sources can be taken as valid documentation for the erosion estimates. This deals with the situation in Africa regarding erosion and agricultural production. According to Lomborg, various sources on the subject are in conflict. It cannot be true both that IFPRI projects an annual growth in yield of 1.7 percent, and that yields will be reduced by half in 40 years due to soil erosion. To support his contention, Lomborg brings a curve demonstrating that cereal yield in Africa has grown at a fairly steady rate of 1 % per year, or 50 % in 40 years. This curve is a correct representation of the data source. But it may also illustrate how both contentions could be partially right. If cereal yields had grown annually by 1.7 percent, then they would have grown by a factor of nearly 2 in 40 years. Actually, they have grown only by a factor of 1.5 in 40 years, as Lomborg´s curve illustrates. That is, the yields after 40 years are 25 % lower than expected by IFPRI. This could possibly be because of erosion. Considering that IFPRI is already aware that erosion may be a problem and may therefore have reduced the intitially expected growth rate to a slightly lower value of 1.7 %, then the opposing views may be more or less reconciled. Lomborg asks that if Friel really had problems finding the references in Cool It, why didn´t Friel instead consult the British version of Cool It, which is better supplied with notes and references. It seems that Friel simply overlooked that there existed another version of the book, and Friel would indeed have been helped if he had been aware of that. That said, it must also be said that is quite unusual to publish a book simultaneously in USA and Britain with the same author and the same title, but with different contents. It is not so strange that Friel overlooked that there exist two different books with the same title. To call that `tunnel vision´ is unduly derogatory. Friel writes in his book on page 69 that Lomborg argues that climate change will have few (if any) harmful impacts. In his rebuttal, Lomborg remonstrates with him, pointing out that he wrote at the start of Cool It: "Global warming . . . will have a serious impact on humans and the environment toward the end of this century." This issue is obfuscated by Lomborg´s peculiar way of writing. Lomborg´s writing aims at two different targets: Some messages are meant to be technically correct, and other messages are meant to affect the unconscious. Typically, he puts a phrase at start which is correct, but very short. Then, he uses a lot of space on evidence that points in the opposite direction, and at the end he has again a short phrase which is correct and gives the main stream contention. The start and end phrases makes him immune to criticism, at the same time as the vast majority of the text conveys the opposite message. What the reader remembers is that which is told in the main part of the text, between the start and end phrases. So Friel is right that Lomborg conveys the message that climate change will have few (if any) harmful impacts. But Lomborg thinks that he is immune to this criticism because of the small phrases at start and end. This way of constructing a text is an example of what is designated `spin´. Friel is right in criticizing Lomborg for using the term `standard future scenario´. IPCC states explicitly that there is no standard scenario. Also, it is wrong to call any of the IPCC scenarios for `business as usual´. In the paper that Lomborg refers to (Dai et al. 2001) there is a scenario which they call `business as usual´; firstly, this is not identical to any of the IPCC scenarios. And second, it is a bad name, because actually it is not `business as usual´ - for instance, in that scenario, the developing world will gradually increase their efforts to combat pollution of the air with sulfates. The issue here is the number of deaths due to heat and cold. First a detail: The 2003 heat wave in Europe was indeed unusual, so on this point, Friel is right and Lomborg is wrong. See here (comment to page 16) in Lomborg-errors. Then about the main point. Lomborg claims that while global warming will indeed increase the number of heat deaths, it will decrease the number of cold deaths by an even larger number. Friel rejects that contention, and his rejection may be justified. The references that Lomborg uses to substantiate his contention are flawed because they assume a large decrease in cold deaths which is rather hypothetical. The circumstance that today more elderly people die in winter than in summer cannot be used as a proof that if the winters were not so cold, fewer people would die overall in the future. This is explained in detail in Lomborg-errors here. The fact is that we have no method to project by how much mortality will decrease if the winters become milder. Furthermore, this discussion focuses too much on the conditions in the cold parts of the northern hemisphere. There is too little focus on the extra heat deaths that will occur in the tropics and subtropics. This is partially because the literature that Lomborg refers to is written on the basis of a special ideological basis in which the value of a human life is much less in the developing countries than in the developed countries. Thus, Friel´s criticism of the main point is relevant, and Lomborg `consistently avoids engaging with the central arguments´ - to use his own words. Next, there are again som smaller details. One detail is that Lomborg writes on page 15 of Cool It about the number of deaths in Athens. Friel has not understood that the figures in Lomborg´s reference have been multiplied in order to give the total number of deaths in the whole of Athens with its 3.1 million inhabitants. Lomborg does actually indicate this in his notes, so Friel´s criticism is not justified on this point. Lomborg has a text on page 17 of his book starting with the words "In Europe as a whole . . . " Friel criticizes that the end note to that passage does not contain a reference to the figures that are presented there. Contrary to what Lomborg postulates, Friel is right on this point. The issue is here why glaciers are dwindling all over the globe. Is it because we are coming out of the Little Ice Age, or because of global warming, or because of both at the same time? Friel criticizes that although Lomborg in some paragraphs states that both causes apply, there are other paragraphs which are written in a way as if the dwindling was only due to coming out of the Little Ice Age. On this point, Friel´s criticism is justified. Lomborg does just that. It seems to be some kind of `spin´, just like it was described above for page 10 bottom. Here it was said: "Typically, he puts a phrase at start which is correct, but very short. Then, he uses a lot of space on evidence that points in the opposite direction, and at the end he has again a short phrase which is correct and gives the main stream contention." This is nearly the same as happens here. I have made a detailed count of lines in Lomborg´s text, stating how many lines deal with one cause, and how many deal with another cause. The result can be read here and it is evident that Friel is right: Lomborg uses so much space to tell that glacier retreat is due to natural fluctuations that the whole text becomes greatly biased. Furthermore, the fact that the retreat of many glaciers stopped during the relatively cool years 1950 - 1970 and then was resumed when temperatures rose after 1970, indicates that we are not seeing a delayed effect of coming out of the Little Ice Age. What we are seeing now, from 1970 onwards, may be wholly due to global warming. The next issue is the melting snow on Kilimanjaro. Lomborg writes on page 56 in Cool It: ". . . Kilimanjaro has not lost its ice on account of increasing temperatures, which have remained rather stable below freezing, but because of a regional shift around 1880 toward drier climates." Friel points out that Kilimanjaro is known to be an exceptional case, and that most other glaciers in the world are dwindling because of global warming. But Lomborg inserts a sentence that suggests that the problem with Kilimanjaro is also the problem of the receding glaciers in general; thereby, Lomborg imparts a wrong impression on his audience. Again, this is a question of whether Lomborg conveys a false impression by indirect methods which appeal to the unconscious mind of the reader. This question cannot be answered definitely, but Friel may very well be right that Lomborg tried to do just that. There is more to be said, however. It is true that a study by Kaser et al. (2004) concluded that glacier retreat on Kilimanjaro is due to a drier climate, but this conclusion may be wrong. The climate has not become drier during the last c. 50 years. Actually, there is evidence that about half of the disappearance of ice on Kilimanjaro is due to surface melting because of warmer temperatures. This is explained here in Lomborg-errors. So when Lomborg writes definitely that ". . . Kilimanjaro has not lost its ice on account of increasing temperatures . . ", he may simply be wrong. The issue here is melting glaciers in the Himalayas. On this point, Friel has not had a lucky hand. First, he accuses Lomborg of `chopping off´ parts of a phrase in a reference. It is true that Lomborg focuses on one aspect of the phrase in that reference, but it is not true that Lomborg completely left out the contents of the latter part of the phrase. Second, he criticizes Lomborg´s postulate that the Himalayan glaciers will only run dry "toward the end of the century". He criticizes that Lomborg´s reference for this statement does not document that; the reference (Schneeberger et al. 2003) deals with 17 glaciers in the northern hemisphere, but none of these are in Himalaya proper, although some of them are situated in the vicinity, west or north of the Himalayas. Lomborg could more probaly have used another of his references for documentation, viz. Lehmkuhl & Owen (2005), in which it is stated (p. 91) that by the year 2100 the temperature in the monsoonal temperate glaciers of China [i.e. Tibet] will rise by 2.1° C and that the glacier area will decrease by 75 %. Friel, on the other hand, focuses on section 10.6 in the latest IPCC report, WG II, where it is stated that the glaciers of the Himalayan region may disappear already by 2035. This, however, has turned out to be a lapse made by the IPCC. They have cited a non-peer-reviewed article from 1999 in New Scientist, and this has later been claimed to be unreliable. The IPCC chairman admitted in 2010 that this statement was wrong. Thus, Friel fails on a number of points here. On the other hand, Lomborg is not completely right. First, Lomborg postulates that he gives a reference to document his claim that "as glaciers melt, river runoff will initially increase". The alleged reference is Singh et al. (2006), but actually, that reference says nothing about clacier retreat, and cannot be used as documentation. Lomborg is also wrong on his main theme, viz. that glacier retreat will mean lots of melt water in the rivers for the next c. 50 years to come. As discussed here (comments to pages 57 - 59) in Lomborg-errors, it is likely that the increased river flow will last only about two decades in the Indus and the Ganges, and river flow will be reduced already from now on in the Brahmaputra. So on the central question - will glacier melt mean reduced water supplies in the near future - Friel is probably more right than Lomborg. This section deals with water shortages. Lomborg writes about Friel: "he surprisingly never challenges or even mentions the main aspect of the chapter, namely that global warming will make for more water availability . . "
Lomborg supports his claim with reference to a paper by Arnell et al. (2004), whereas Friel supports his claims with reference to the latest IPCC report. Now, the IPCC report (WG II, section 3.5.1) cites two references. One is Arnell et al. which indicates that global warming will reduce the number of people living in water-stressed watersheds. The other is Alcamo et al. (2007) which indicates that global warming will increase the number of people living in water-stressed watersheds. No one knows what will actually happen; the conflicting results mean that we cannot make any cocksure claims. But Lomborg cites only Arnell et al. and states with no reservation that warming will make for more water availability. Thus, Lomborg´s text is biased, and it is right of Friel to criticize it, even though Friel does not hit very precisely with his criticism. A minor issue is that Friel has not been able to find the source of one of Lomborg´s quotes from a UNESCO document (footnote on page 19). Here, maybe both are to blame. Lomborg has failed to state that the quote is from the executive summary, which is downloaded from another URL than the "full document"; and Friel was not smart enough to detect that Lomborg had this flaw in the reference. The last part of this section deals with Lomborg´s claim that "we could bring basic water and sanitation to all of these people within a decade for about $4 billion annually." Friel criticizes this because the reference says $10 billion annually. Lomborg explains that the difference is because he has recalculated the yearly expenditure as an annuity, using a discount rate of 5 %. The question is if this recalculation is justified and is presented properly in Lomborg´s text. My conclusion, as explained for page 111 here, is that it is not. So Lomborg has indeed made a kind of error here, which means that Friel´s criticism is justified. S. Jenouvrier & H. Caswell (2009): Proceedings national academy of sciences USA 106(6): 1844-1847. So the information given here by Friel is not in general based on non-peer-reviewed studies. Concerning that Arctic Sea ice is rapidly shrinking, this shrinking has been rather much sustained, and it is not true that everybody that believed in the shrinking looked a bit silly. Indications are that the shrinking will continue. Concerning the worsening food situation, Lomborg says that Friel makes no effort to show that this is due to global warming. The incresing hunger, he says, is not the result of poor harvests, but a result of high domestic food prices. Here, however, we should remember what Lomborg himself said about food prices in The Skeptical Environmentalist, p. 62, where he comments on the steady decline of food prices up to the year 2000: "Since prices reflect the scarcity of a product, foodstuffs have actually become less scarce during this century . . ". So, when things go in Lomborg´s direction, prices indicate abundance or scarcity. But when the trend is reversed, prices suddenly no longer indicate abundance or scarcity, according to Lomborg. This way of reasoning is, of course, not tenable. So by the standards set by Lomborg in TSE, Friel is right. Concerning Lomborg´s lengthy response against Scientific American in 2002, Lomborg forgets to remember that this rebuttal was dealt with by a counter-rebuttal from Scientific American. Lomborg likes to claim that he refuted Scientific American´s criticism. But he didn´t. He only wrote against it. That is not the same. In his concluding paragraph, Lomborg writes that the proposition that he tried to `deceive´ the public might be laughable if it were not so offensive. Well, the whole purpose of the Lomborg-errors web site, as stated on the front page, is to document that indeed, Lomborg tries to deceive the public. In my own opinion, I have successfully documented that this is indeed the case on my web site. Lomborg criticizes that Friel has not at all entered the field of economic considerations. Concerning this, Friel has the perfect right to write about what subjects he wants. If he wants to restrict himself to the facts about global warming, he can do that. On the Lomborg-errors web site, on the other hand, I have chosen to discuss the economic aspects just as well as all the other aspects. See for instance here. In this discussion it appears that Lomborg´s treatment of the economic aspects are quite tricky and not very transparent. There is much squeezing and boosting of figures in order to make them look large or small, depending on what is favourable to Lomborg´s point of view. Much of this squeezing and boosting is done with the tool of discounting, which introduces a fundamental subjectivity into the whole matter. This makes the discussion of the economic aspects quite difficult, and it is no wonder that most non-economists refrain from entering that discussion. Other methods of manipulation lie for instance in setting the value of human lives. It can be said here that if anybody has a suspicion that the economic calculations are a jungle of manipulation, they are probably right. There are several chapters in `The Lomborg Deception´ that Lomborg has not commented upon. Not surprisingly, some of these chapters deal with issues where Lomborg is very much wrong. For instance, Lomborg has severely misleading texts on polar bears and on ice melt in Greenland and Antarctica. One will be well served by reading the chapters on these subjects in Friel´s book, or one may consult the relevant pages in Lomborg-errors on polar bears and ice melt.